Approximate running time: 1 hours, 45 minutes. 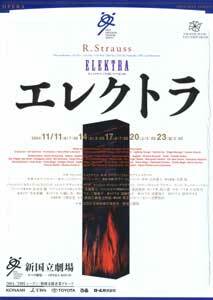 The second new production for the 2004/2005 season whose theme is the "Fate of Women" is Elektra, a gruesome revenge tragedy. In this opera, Elektra, a daughter of the blood-smeared Atreus family, burns with the blind desire for revenge, killing herself after she has achieved her long-held goal. The drama, based on Sophocles' Greek tragedy, is condensed into a one-act opera. The music, played by an orchestra of the largest-ever scale in operatic history and controlled by the voice of dramatic sopranos, eloquently expresses the rapid changes of the characters' sentiments - tension, hatred, fear, joy, ecstasy. Hans-Peter Lehmann will step deeply into the psychology of Elektra to depict her extraordinary attachment to her father, which Freud called the "Elektra complex." Ulf Schirmer, who left a glaringly vivid impression on the audience last year with Le Nozze di Figaro, will appear at the NNTT again as the conductor. Two dramatic sopranos-Nadine Secunde, who started with her debut at Bayreuth and is currently active chiefly as a Wagnerian and Straussian singer, and Karan Armstrong, who boasts of her indisputable position as the prima donna of modern and contemporary music-will confront each other and create an intense drama together with Nancy Gustafson, Richard Brunner and other singers. Taking on the challenge of performing Elektra, which is said to be difficult to perform because all roles are difficult to sing, will open a new page in the history of the NNTT's performances of Straussian opera, which have constantly won high praises.